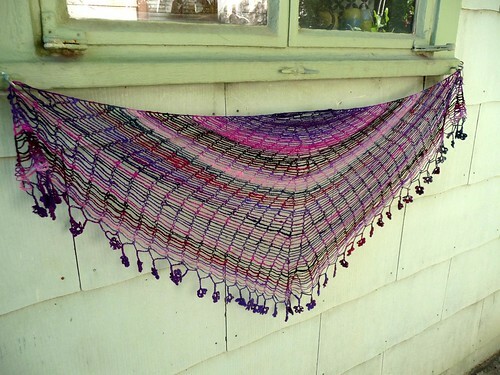 Lindamade » Sprout Shawl Complete! I finished my Sprout Shawl (made with Noro Kirameki. designed by Kristin Omdahl) this week. I’m in the midst of too many deadlines, and clearly my priorities are in order! Here it is blocking. I finally bought blocking wires, since I’ve been working with more and more lace. Of course now that I have them, I realize they are great for all sorts of projects. I used them to block my very first adult sweater design this week (more to come on that later!) and I love them. It’s a bit tedious to thread them through the fabric, but less tedious than sticking a bunch of pins in your piece, and with a better overall result. 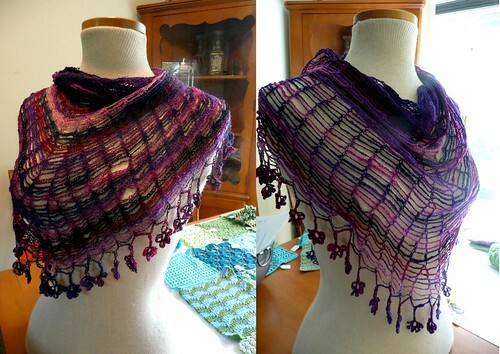 Et voila– here you can clearly see the blocking before and after. I liked the rustic look of the shawl before it was blocked, but it was kind of small. After (right) you can see that it’s much more spread out, and it’s also much more airy and drapey. Here it is against the side of our house. 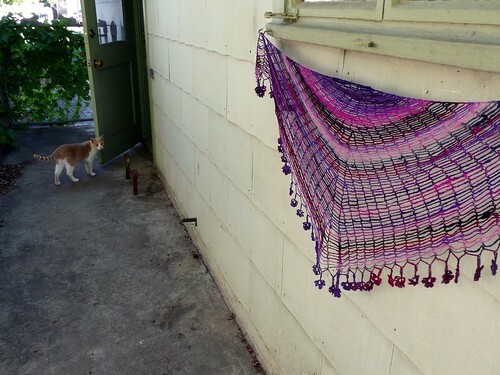 I’m sure my grandma put up those hooks for hanging plants but they are also perfect for displaying shawls. Blondie (the kitty) was interested in the shawl too, but he’s camera shy. Details: I kept going with the pattern so that I had 23 chain loops on either side of the center loop. That will make sense to you if you have the pattern, I just did a few more sets of repeats. 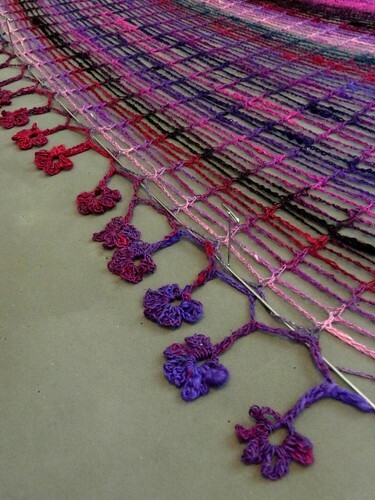 The shawl measures about 54″ wide, not including dangly bits. I did not use the entire skein, but ended in a good place since I wasn’t sure how much yarn the flowers would take. I’ll probably wear it granny bandit style, except ouch, I have to let it live at the shop first! Love. It. And I have GOT to get myself some blocking wires. I always dread blocking lace stuff because of all the pins! I think the wires would make it a bit more tolerable. Thanks! I don't know why I waited so long to buy the wires but they were worth every penny. Considering that I'll use them for....the rest of my life! Yes, Linda, I am LOVING this shawl! I started one not long after you in some pretty Etna yarn. It's just a springy yarn and I'm worried about how much further I should go. I'm not sure the drape will compliment the pattern... :-S I might start it over in something else. Anyway, I love your work and I just got the Nov. issue of Crochet Today. I always enjoy your column. :) Have a great day! Lovely! Those little flowers are adorable.